Phone interviews can be a great method to get knowledge about a candidate before making a decision to get them in for an interview in person. With the help of phone interviews, hiring managers, employers and HR professionals are able to improve their opportunities of discovering the ideal employee by finding out candidates that stand out and filtering out those who are not the right fit even before a face to face interview which is particularly time consuming. 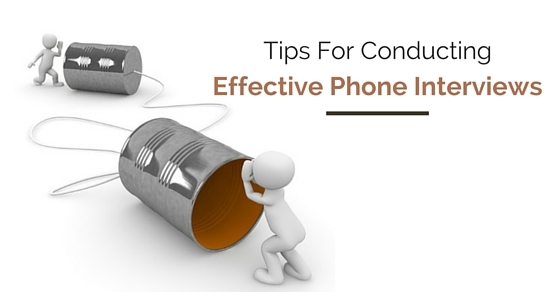 Follow below tips for conducting phone interviews effectively. The following mentioned are few tips for phone interviews and also conducting interviews effectively. Make sure you have consistent and good mobile signal if it is a mobile phone. Even make sure it is fully charged. Do maintain a notebook, pen and other noting tools. Make sure you have the phone number and any other contact details with you. It is crucial to learn about a candidate as much as possible prior to an interview. Do have in front the resume, LinkedIn profile and any other such additional details that must have been provided, through online application or such. Even make sure that you have the description in front of you of the job title you are hiring for, to ask them questions related to the experience they have mentioned in the provided information. Know what you wish to ask and generate questions to ask at interview to acquire complete knowledge about the candidate. Keep it short and direct. Four to six advance phone interview questions must be prepared. Each of the questions must be prepared in advance as it must be designed to grant you with a specific data related to each of your job requirements. It is crucial to make the preparation for the candidate easy, for the interview and hence send them complete details about the company, of the people they will be speaking to and the related phone numbers. Sharing the plan can be beneficial and helpful as well. For a more balanced perspective on a candidate, you can pair up with another person from the company for conducting the interview. Candidates will also find it helpful to be able to speak with two people and ask questions to each. Any kind of meeting must be held in a private and peaceful setting without any distractions. However with phone interviews increasing, interviews are being conducted during traveling or in some crowded area. However it is ideal to choose a quiet and calm place to carry out phone interviews, even with mobile phone portability. Always bear in mind that the candidate is judging you as well. Phone interviewing is not the moment where you can text message someone or can check e-mails. You need to eliminate any kind of distractions that you are aware can disturb you and try to focus on the interview. A number of people are comfortable speaking in person and some on the phone. You must maintain the face to face interview principles, ask short questions and listen to the candidate throughout. The phone interview is a filtering system for both the candidate and the recruiter so it will be good to not turn it into a complete interview. Remember if you conduct a complete interview during phone interview there will be nothing much left to talk about during an in-person interview. It will be ideal to wrap up the conversation in 15 minutes or half an hour. It is good to have a structure for the interview, so that you do not miss out on anything, ask all the questions you wished to ask so that the candidate has had his chance to enquire about everything he wanted to know. You can even create a checklist to make sure you are on track with the structure you have prepared. It will even help you to not miss out on any part during the phone call. As you gradually conduct and get done with each step you can mark off the step from the list. The ideal structure for an interview can be by starting with an introduction of you or anyone else that may be involved in the call and then follow by thanking them for their time and look for any initial concerns. Provide them with a short but sufficient introduction about the company and the role and then let them give overview about themselves. Have a transparent discussion with opportunities to clear all concerns and close it with providing details about further actions. Job seekers may never know when a recruiter may ask them certain question that will be unique and odd during an interview. It goes the same for recruiters as the candidate during the phone interview might pop up some question out of the ordinary or says something alarming or surprising. Preparing for job interview in advance will be beneficial to give away the right and appropriate answer to any rare situations arising. Make abundant notes on the candidates. You are probably not going to remember all that you have spoken about and so it is appropriate to make notes. Using a whiteboard will be helpful too, so that you can create a mind map while still on call with the candidate. However a simple notebook will at all times suffice. During in-person interviews, you are able to receive much of the meaning of the conversation through non-verbal communication such as gestures or facial expressions. Thus during a phone interview, you must compensate for this lack of non-verbal clues through paying attention to every word that is being said and acknowledging the fact that at times, words may not be able to convey the true message. When you have doubts and if did not understand as to what is being said then take a proactive step to dig deeper. Do not leave the doubts hanging and misunderstanding a candidate. Provide occasional verbal feedback so that the candidate in the other end also knows that you are paying attention to what they are saying. Suitable and simple, “yes” or “okay” is sufficient for timely feedbacks. Strictly avoid eating or drinking during a phone call. It is really rude and unpleasant and so be vigilant about not eating or drinking when you are phone interviewing. A competent candidate will probably have a lot of questions and concerns. They are most keen ones to know more about the company, role and even you. Grant 5 minutes prior to the interview and 10 minutes after the interview for the candidates to question. You must conduct the phone interview at a time that is apt for the candidate. Majority of the applicants must already be employed and so will not be able to manage time out easily from their present working day to communicate with you. Hence it is essential that you become flexible and offer time options so that they can pick a time suitable to them. An interview is a two way process. It is as crucial to selling you and the job as much it is about assessing the candidate’s eligibility. Competent candidates will have numerous offers and options to choose from and hence be flexible from the beginning itself to make it painless for them to speak to you. At the time of wrapping up the phone interview, make sure you communicate the action steps and make the candidate aware of the next steps in the process. This will help in controlling any unnecessary follow up like phone calls or email from the concerned candidate wondering when you will be contacting him back. Let the candidate know where you stand in the process and thank them for their time. You can write down any final notes on the candidate in the end of the phone call and file it against the candidate’s application. It will provide plenty of cross reference and is an appropriate method to guarantee that you have secured relevant and judicious details about the candidate. When you know you have acquired the apt candidate for the interview process you can take the opportunity to even schedule an in-person interview. It will rescue time and efforts as you already have the person on phone. If you find a candidate interesting and suitable for the job you can even discuss special details like transportation, travel or even the salary. The ability of the candidate to travel or work during weekends etc can be discussed. Take the opportunity to converse such issues when you find a candidate persuasive. You need to take phone interviews seriously, do the sufficient preparation well in advance and structure the interview to get the best of results from it. If conducted properly, phone interviews are a great method to acquire more knowledge about a candidate and learn more background details. Utilizing the above phone interview tips will be advantageous for conducting phone interviews effectively. Next articleWhy Internships are Important for Employers and Students?